Jennifer Giorno, our amazing costumer, put together such a gorgeous collection of looks for our production at Arisia 2015. 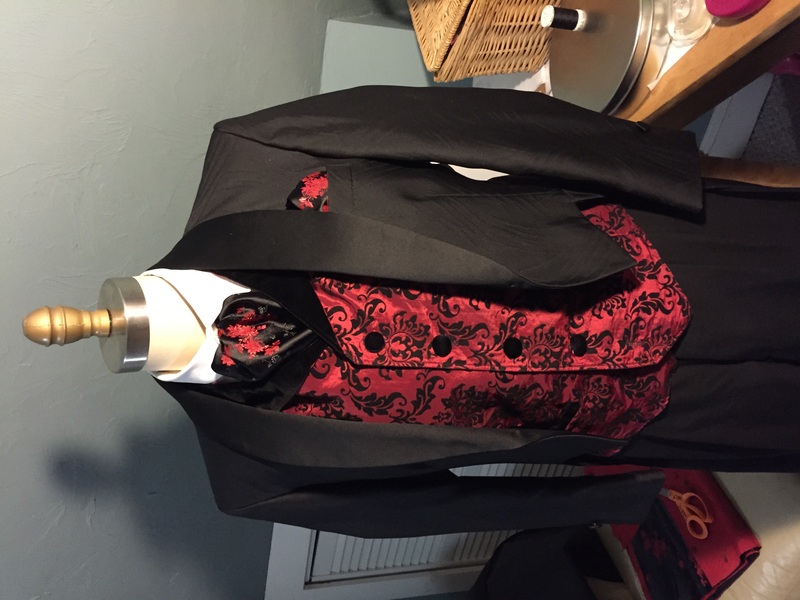 Historical Victorian dress, particularly for men, was very strictly regimented, but we still wanted to balance that with creating a visually engaging stylization that spoke of our characters’ personalities as well as provide texture to the world they live in. In addition to our leads, Jenn assembled a beautiful collection of looks to round out our supporting cast. Many pieces came from our personal collections, while others were very generous loans from our friends Lise Fracalossi and Nicholas Magruder. I particularly enjoyed the tuxedoed looks, mostly borrowed from our obliging friends. It’s a style of dress I’m a big fan of, but nowadays there’s so little occasion to ever see anyone wearing it. But we had a number of evening scenes full of high-class gentlemen, so that meant we had to get them right. As you can see with these looks on Matthew Kamm, Francis Hauert, and Jonathan Plesser, we took a little bit of liberty in throwing in touches of color. This is where the vests generously lent to us by Lise Fracalossi came in. The red and black scheme was a nice visual cue as to Lord Brockton’s villainous nature, and the earth tones on Sir Walter spoke to his roots as a country squire. Nathaniel’s shades of gray and silver made him look sophisticated and stylish, which was how I always saw the character. The cravats were made by me, out of fabric specifically chosen to coordinate with the colors of the vests. Nathaniel’s day look as worn by Jonathan Plesser was also nice. 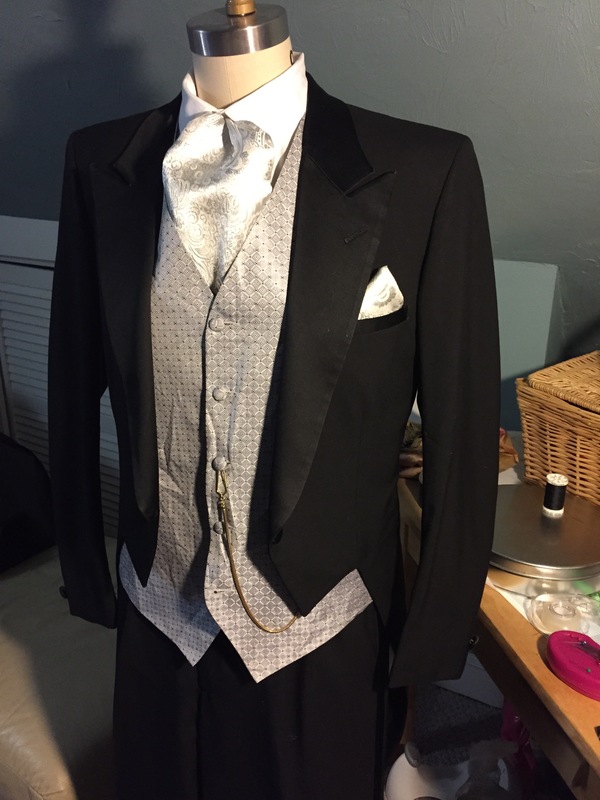 We wanted it to look noticeably different from the eveningwear, so we decided to cast it in gray, with a morning coat over a pinstripe vest. The silhouette is nicely differentiated from the cutaway tailcoats in the tuxedo ensembles. 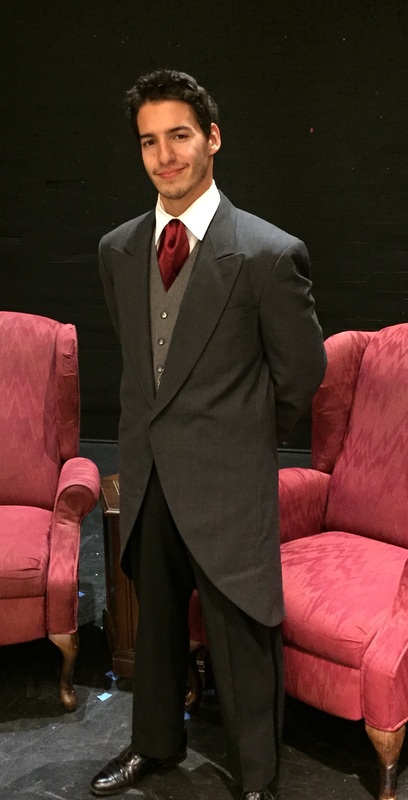 The burgundy cravat was an afterthought, but I liked how it tied Nathaniel into the dark red color scheme of Mrs. Hawking’s parlor. It at once says he’s of this place, which is both a cage and a safe place for our hero. 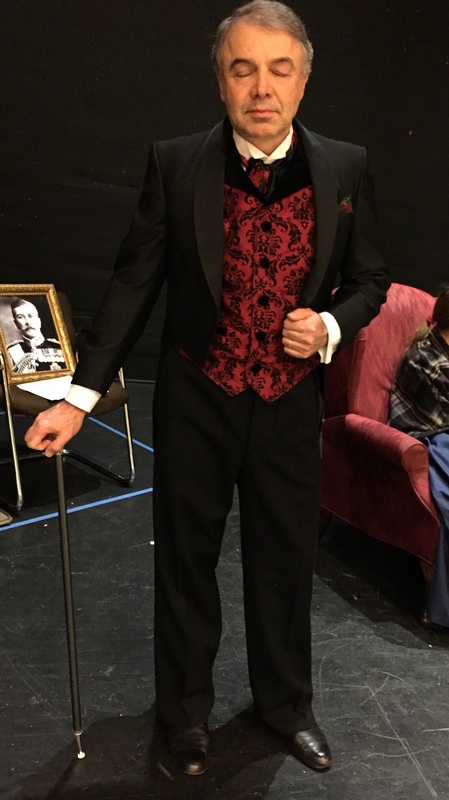 The other two male day looks were worn by Francis Hauert and Bobby Imperato as Lord Brockton and John Colchester respectively. 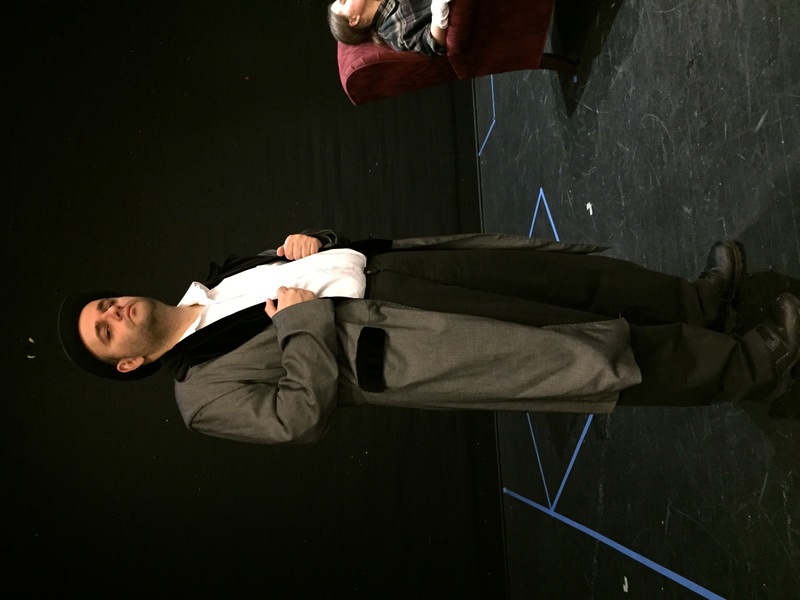 They wore handmade frock coats, more borrowed pieces from the generous costume maker Lise Fracalossi, in various shades of gray. 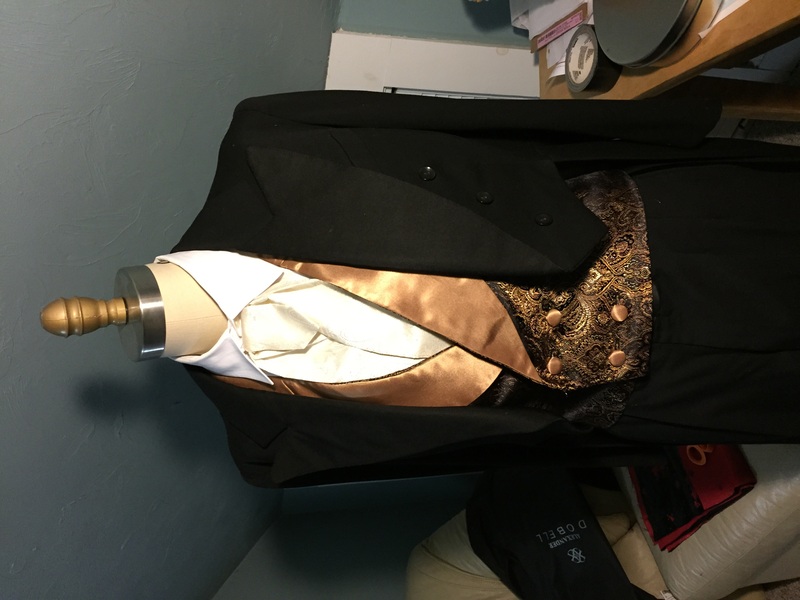 Lord Brockton also wore another vest, this time in black and gold, along with a gold silk necktie. And you can’t deny the iconic thug look of a Victorian baddie in a bowler. Lastly, we have the ladies. 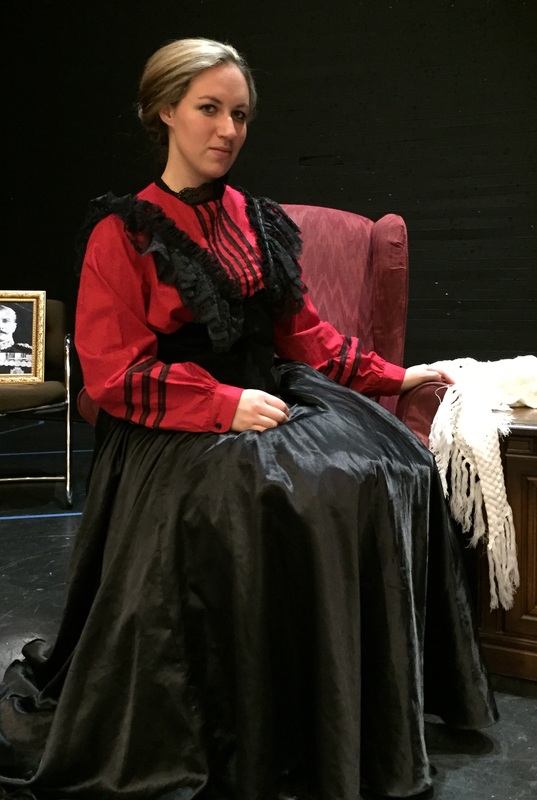 On one hand, we have the high-class lady, Arielle Kaplan as Mrs. Celeste Fairmont, in a brightly colored blouse decorated with lace and a full satin skirt. 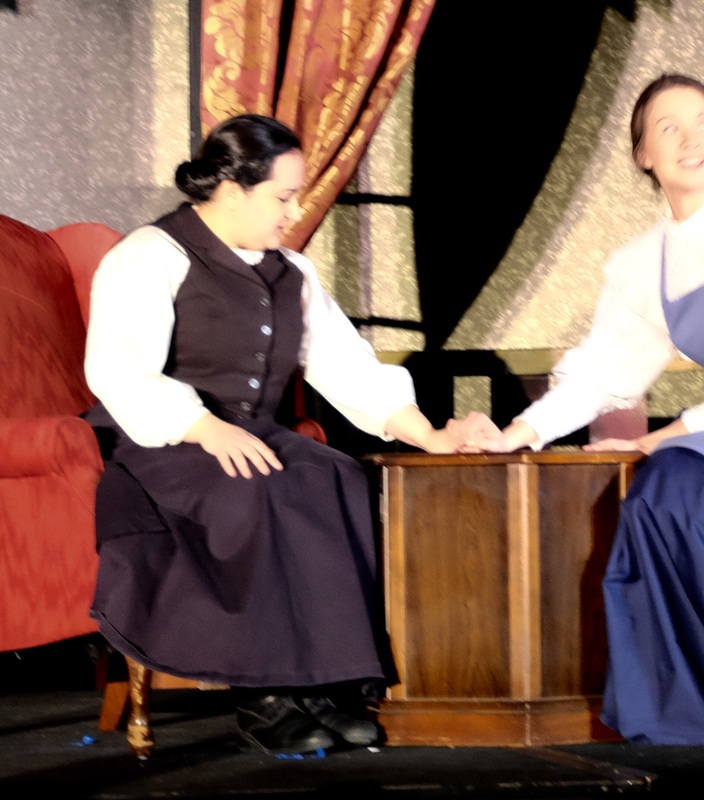 On the other hand, we have the lower-class example, Jenn Giorno as Miss Grace Monroe, in a plain blouse, a navy twill skirt, and the only vest in the piece to be worn by a woman! I really love how these costumes contrast in color and in texture, drawing a strong visual distinction between the middle class lady and the working class girl. These pieces are from Jenn’s personal collection, informed by her vast knowledge of Victorian costuming conventions. We were really lucky to have someone as hardworking and passionate as Jenn designing for our show. 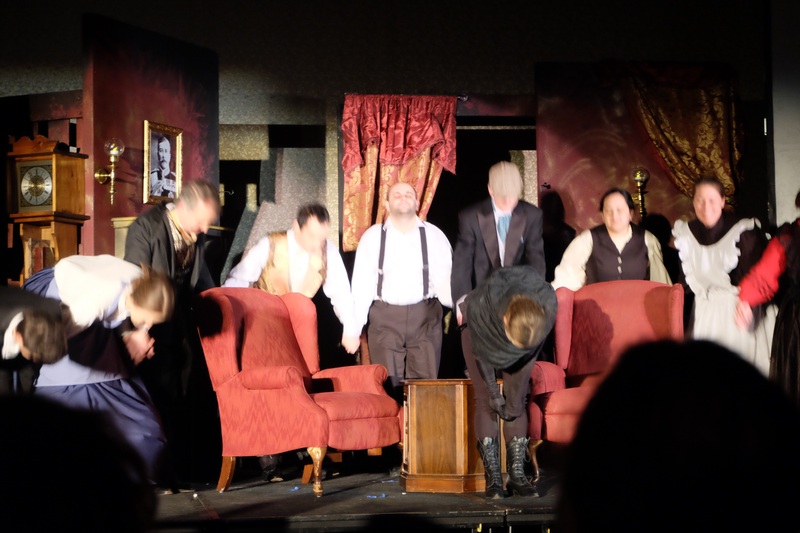 It increased the visual punch of every moment our actors were onstage.